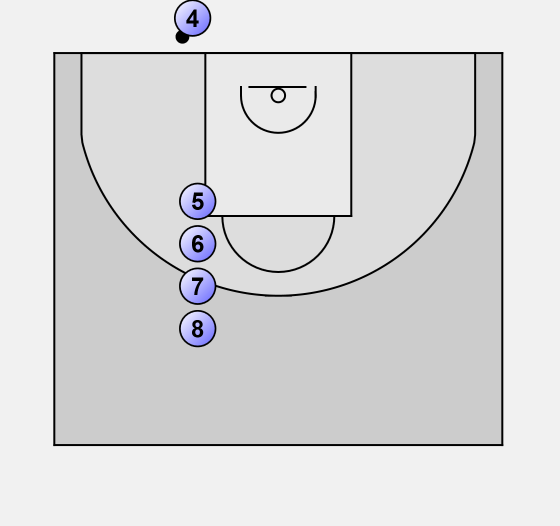 # 4 is the in-bounder, the other four players form a stack at the ball side elbow. The plays starts with # 4 slapping the ball and the players go according to the move, right, left, straight and hold. #5 cuts to his right, # 6 flashes to his left, #7 cuts straight to the ball and #8 holds the position and gets prepared to move to his right of left to become a open receiver. # 4 is unable to pass the ball to the players cutting right, left and straight so he passes to # 8, who if open can go for a quick 3-pointer or looks for # 5 setting a down screen for # 4. 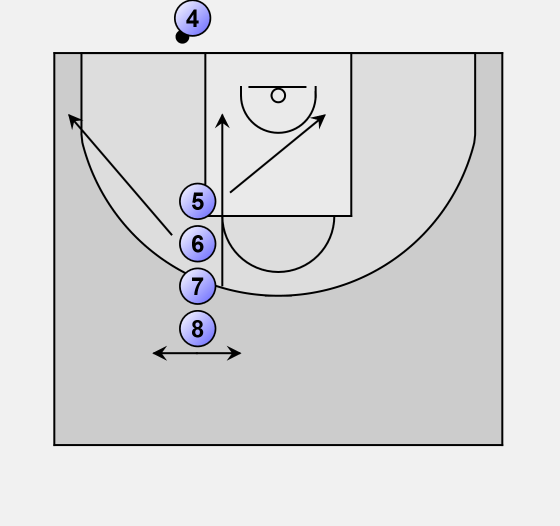 # 8 passes to # 4 for a quick jumper. # 5 rolls out to the ball side corner. If # 4 is unable to shoot with the defense switching so on the other side # 7 who has now moved to the opposite low post sets a back screen for # 6 and gets open to the ball side to be available for a pass for a quick jumper. # 4 has to option to look, if there is no switch, he can pass the ball to # 6 for a lay-up and if there is a switch then # 7 is open for a quick jumper.